Have you ever thought of growing your own potatoes? You’d be surprised how many people do and maybe more surprised to learn how many types of potatoes are available. Coliban – A floury white fleshed potato that is good for mashing, baking and frying. Desiree – A very popular all-rounder with pink skin and pale yellow, firm flesh. Excellent boiled, baked, mashed and in salads but not recommended for frying. Dutch Cream – Large waxy oval potato with yellow flesh, thin skin and a rich, buttery taste. Gorgeous mashed, boiled, roasted and baked. Pontiac – A very reliable all-rounder with pink skin and white flesh. Great to boil, bake, roast, microwave and mash but not so suitable for frying. Nicola – A long to oval-shaped waxy potato with yellow skin and flesh with a buttery flavour. Makes a terrific salad or boiling potato but is also great for mash, dry baking, gratins and baked dishes but not recommended for frying. Kipfler – A waxy, finger-shaped potato with yellow skin and a light yellow flesh with a buttery nutty taste that is great boiled, steamed, in salads and roasted can be fried but is not recommended. Sebago – A long to oval shaped all-rounder with white flesh and skin that’s common in shops around Australia. This potato is great for boiling, mash, roasting, baking, chips and mash. Dig plenty of well rotted manure into your garden bed or growing bag. Cut the seed potatoes into quarters ensuring that there is an ‘eye’ on each piece. Dig a trench about 30cm wide and 20cm deep and place some manure at the bottom of the trench. Place the pieces of seed potato at the bottom of the trench with the eye facing upwards. Fill in the trench covering the potatoes and water in well. As the shoots of the potatoes start to appear cover them over with soil and keep covering over for 5 weeks. Potatoes are ready to be harvested once they are big enough to eat, just pull away some of the soil to check the size and harvest as required. 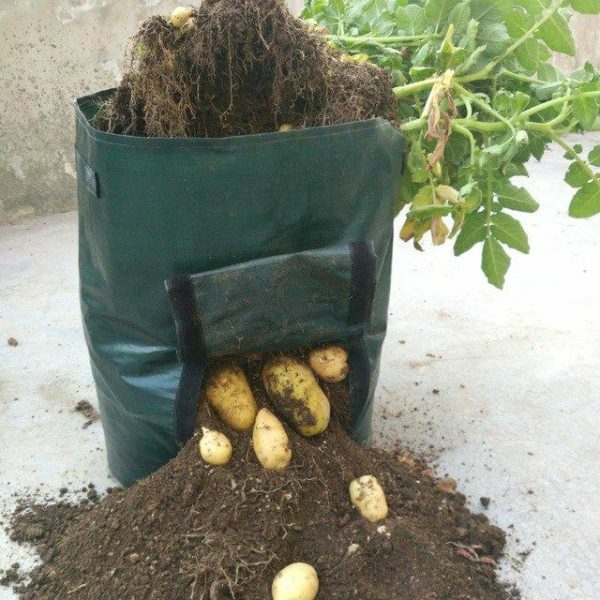 Potatoes that are not at the size you require can be left in the ground to grow bigger. We have a fabulous range of Seed Potatoes arriving during April. If you require any further information about growing Seed Potatoes or anything else in your garden, please call into the nursery at 118 Macleans Point Road, Sanctuary Point.